Valley characterized by theater-shaped alcoves. Characteristic features include smooth steep-sided valley walls containing sharp wall-floor junction angles, smooth valley floors with wide U-shaped profiles, abrupt theater-like head terminations (Kochel and Howard 1985), and short stubby tributaries. Sapping: Martian amphitheater-headed valleys are apparently similar to channels that form by headward erosion of groundwater seepage. On Mars, a possible source of water for sapping could be the melting of ice or infiltration of surface water (Mangold et al. 2008). Lamb et al. (2006) suggested that groundwater-sapping origin for the Martian landforms is based primarily on the assumption that seepage erosion creates a distinctive morphology, but this assumption may be wrong. Morphological features alone may not be diagnostic, and the same features that characterize sapping valleys can be produced by runoff- or glacier-eroded valleys (Howard 1988). Sapping is effective in cohesionless sediments (Howard and McLane 1988), whereas the role of sapping remains unclear for valleys carved into bedrock (Lamb et al. 2006). Since heavily cratered terrains are probably well permeable because of heavy fracturing resulted from impacts and due to brecciated and coarse-grained (silt or clay-sized) property of impact debris, it might provide sufficient conditions for sapping. Infiltration could have been supported by enclosed depressions and craters on the impact terrain (Howard 1988). A combination sapping and runoff erosion: These valleys may have developed through a range of combinations of runoff erosion and seepage weathering (Luo and Howard 2008). In certain cases strong evidence exists for only surface runoff while there are no observable signatures of sapping process (Gulick and Baker 1989), and in other cases like Tinto Vallis (Erkeling et al. 2011), precipitation-recharged groundwater sapping is inferred (Grant and Parker 2002). 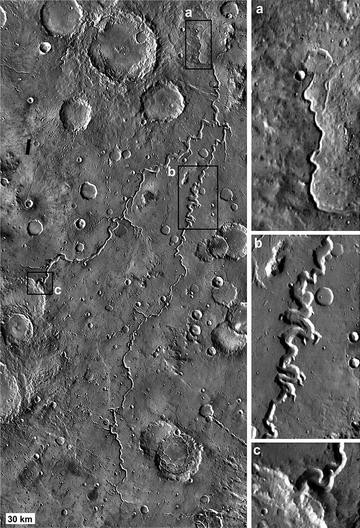 Analysis of some of the prominent drainage systems on Mars suggests that sapping occurred after the surface runoff had produced the original channels (Aharonson et al. 2001), e.g., when weakening of surface runoff left sapping as the dominant valley forming process, reactivating previously formed fluvial valleys (Baker and Partridge 1986). Catastrophic water discharge: Kraal et al. (2008) suggested that at least some of the amphitheater-headed channels on Mars were produced by short timescale catastrophic processes. Stepping (terraced) deltas associated with short, amphitheater-headed valleys are indicative of a “sudden release of water from subsurface water reservoirs, massive discharges, and short timescales” (Kraal et al. 2008), for which water may have been provided from melting ground ice (Hauber et al. 2013). Toppling of jointed rock during megafloods. Headwall retreat by block toppling may be the dominant process in producing amphitheater valley heads, e.g., in basaltic landscapes that lack strong-over-weak stratigraphy (e.g., Lamb et al. 2008, 2014; Lamb and Dietrich 2009). Based on investigations on the formation of Box Canyon, Idaho (Lamb et al. 2006, 2008), and Malad Gorge, Idaho (Lamb et al. 2014), these amphitheater-headed canyons were suggested to have been carved by catastrophic flash floods which may provide an analog for similar Martian features. 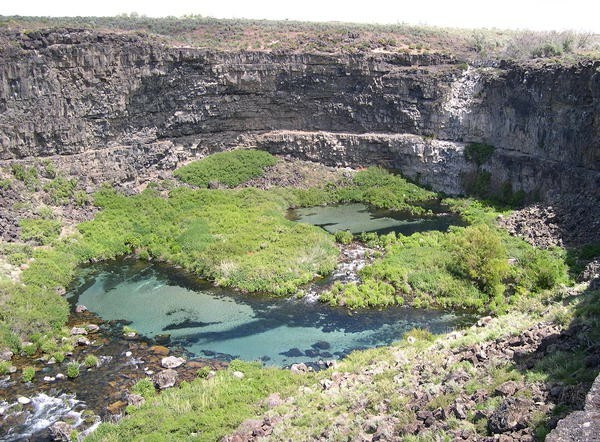 Vertical drilling of plunge pools (Howard et al. 1994; Lamb et al. 2008). Example: Waipio Valley, Hawaii (Lamb et al. 2007). Plunge pool undercutting in strong-over-weak stratigraphy where plunge pool erosion and mass wasting drive headwall retreat in upstream propagating waterfalls (e.g., Lamb et al. 2006). Examples: Box Canyon, Idaho (Fig. 4), Niagara Falls, Kohala valleys in Hawaii. Amphitheater-headed valleys on Mars show diverse ages, and their formation is not limited to a warmer early Martian climate (Goldspiel and Squyres 2000). Nanedi Valles (Fig. 1), Nirgal Vallis, and valleys associated with fretted terrain are late Noachian and Hesperian in age (Harrison and Grimm 2005). Amphitheater-headed valley associated deltas around Chryse Planitia were determined to have ages ranging from 3.6 to 0.3 Ga (Hauber et al. 2013). Nanedi Valles (Fig. 1), Nirgal Vallis (Harrison and Grimm 2005), Bahram Vallis (De Hon and Washington 1999), channels on the flank of Hadriaca Patera (Crown and Greeley 1993) on the eastern rim of Hellas Basin (Lahtela et al. 2011), the structurally controlled Sacra Fossae (Fig. 2; e.g., Chapman and Tanaka 1991) in the Valles Marineris canyon walls (Harrison and Grimm 2005). 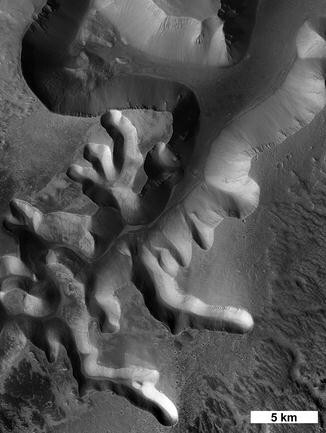 Amphitheater-headed valleys on Mars include flat-floored sections of valley networks (Williams and Phillips 2001) and tributaries of outflow channels (Harrison and Grimm 2005; Fig. 3). Channel network in the Florida Panhandle carved into unconsolidated sediments is proposed to be sapping valleys (e.g., Perron and Hamon 2012). In Glen Canyon, Colorado Plateau, USA, where water emerges from bedding plane boundaries, between permeable, relatively unjointed (hence collapse-resistant) but easily weathered sandstones overlying impermeable, but mechanically weak strata, was proposed to be formed by sapping (Laity and Malin 1985) or by overland flow through plunge pool erosion and transport of collapsed debris (Lamb et al. 2006). Malad Gorge, Idaho, is proposed to have formed by rapid megaflood erosion (e.g., Lamb et al. 2014). Valleys in basaltic bedrock in Hawaii, which has similar lithology to where some of the amphitheater-headed valleys occur on Mars, were proposed to have formed by sapping (Kochel and Piper 1986), but Lamb et al. (2006, 2007) found that these are associated with waterfall plunge pools.